Take a look at this beautiful glass chain maille pendant! 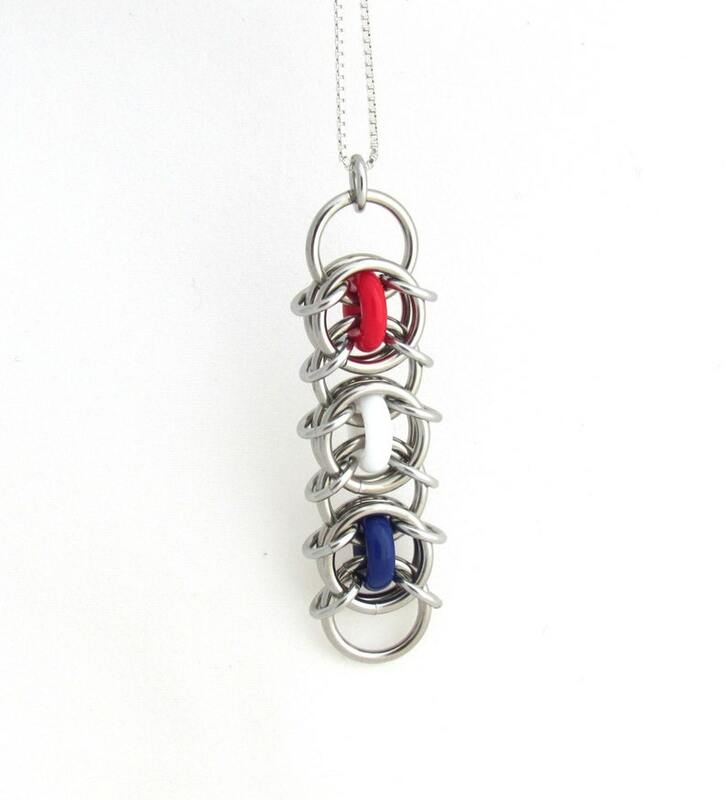 Featuring glass rings in American colors of red, white, and blue, this steel and glass pendant is a wonderful way to start a collection of chain maille jewelry and show your American pride! This patriotic pendant was crafted out of stainless steel jump rings, as well as glass rings in opaque red, white, and blue. It measures approximately 2 1/4 inches long and 5/8 inch wide. Stainless steel is a very durable material that resists tarnishing. It is very strong and therefore unlikely to bend out of shape. It also gives the piece a nice weight, without being too heavy. To clean, a little mild soap, water, and a soft cloth are all that are needed. If you have any questions, please don't hesitate to contact me. I am also able to make custom orders in your choice of colors. Just convo me if you would like more information!